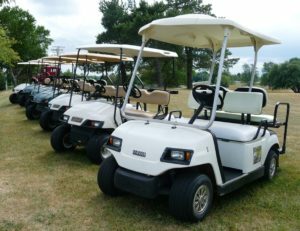 For your convenience, on site golf cart rental is available. Enjoy the convenience of getting around our huge campground with the ease of a golf cart. Available in basic carts and deluxe 4 passenger carts for daily or weekly rates. ♦ Please remember, you must be a minimum of 25 years of age with a valid driver's license, to operate any moving vehicle within our campground, which includes driving golf carts. ♦ Please remember, golf cart speed limits are 10 mph. Watch for children at play. 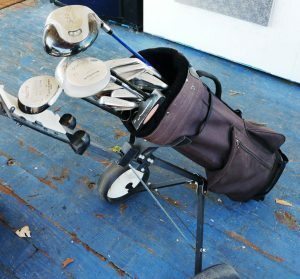 For your golfing convenience, Bill (store proprietor), has sets of clubs with a pull cart in both left hand and right hand clubs for $10 per day. Inquire inside C & B General Store by the beach during store hours.